Welp, I don't want to overload you with too much cuteness this Friday. Oh wait, I just did? Sorry. Meet the latest addition to our family. 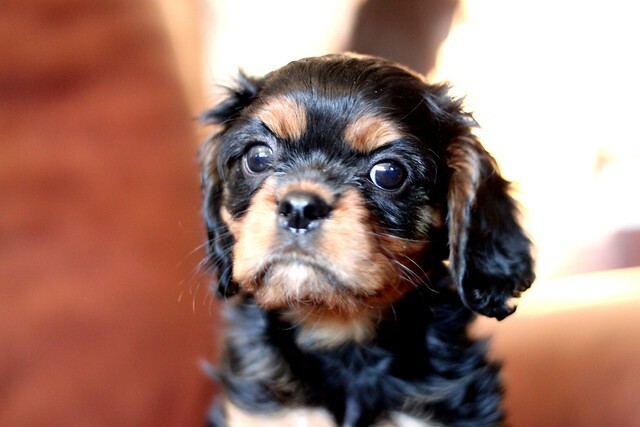 He is a two month old Cavalier King Charles Spaniel, who happens to be the biological brother to our one-and-a-half year old girl dog, Tayla. After much deliberation from Husband and I, we finally agreed on a name this morning. And that name is - Bentley. Ok. Now before you gasp, "Ohhmigosh like that big butthead from The Bachelorette?" No. It is NOT after that guy. Promise k? Current facts: When Bentley is not napping, he likes to run around in circles really fast and then bump his head into walls. He is stealthy like a ninja and when you least expect it, he will attack your toes with his sharp little teeth. Bentley rules the roost over Tayla and prefers not to get his picture taken. Tayla on the other hand does. Both are ridiculously good snugglers and have an affinity for wagging their tails. Happy Friday. Nothing makes me happier than puppy pictures. What a cute little nugget you have! Oh puppies. Bliss. Awww! SOOOO stinking cute! those big eyes.. wowzah. that is the most adorable puppy ever! 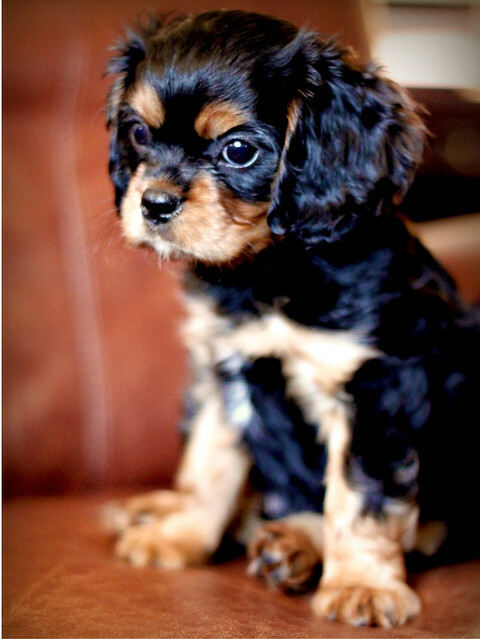 :) I have never seen a pretty King Charles spaniel- awh my heart is melting and I personally love the name Bentley, but hate that GUY/JERK! ENJOY HIM! Aaaaaaaaaawwww!! These wrentit exact kind of dog I've always wanted!! Love them! These two are perfect!! 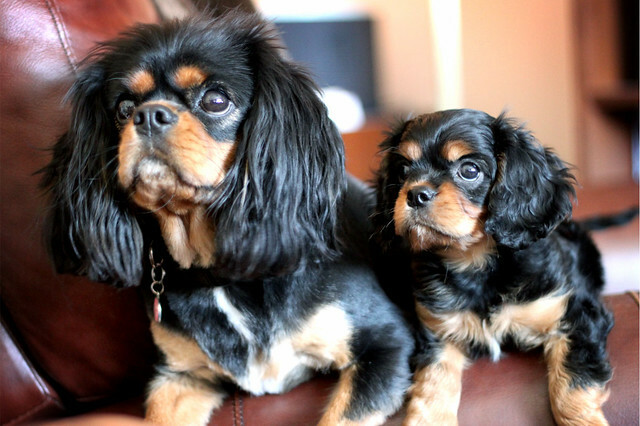 I LOVE cavaliers!! Our family has one. Sweetest little face ever! Congrats on the new addition! He's so adorable!!! Have fun with him! Your dog is absolutely adorable, and Bentley is a great name! They both are precious!! I love their coloring. I just died and went to (doggy) heaven. That MUST be the cutest dog in. the. entire. world. He is amazing!! Bentley is such a cute little pup. Congrats on the new addition to the family. OMG. I totally want to go out and get myself a cutie too! Awww, I just can't get over it! SO cute. Nothing like a new puppy! oh my gosh absolutely adorable!!!! Just shoved the computer into the boyfriend's face going "OOOOOOH!!!! PUPPY!!!!!!!!!!!!" He's so adorable. Congrats ! 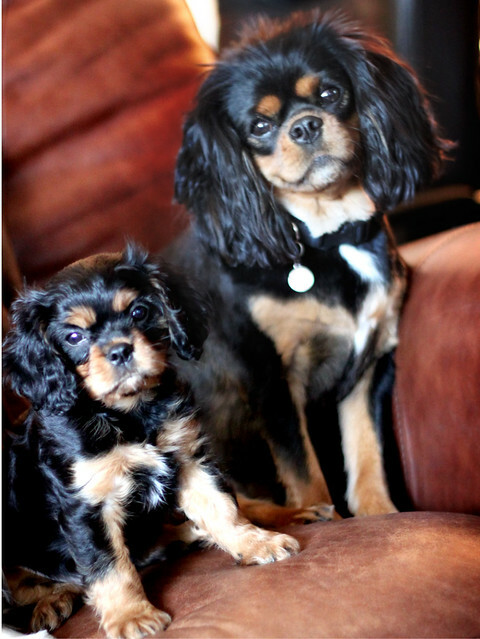 oh i am SUCH a cav king charles fan. they are the best. jeaaaaaaaaaalous. oh my word. He is the cutest ever!! I cannot get over his sweet expression! OMG! He's the most adorable little puppy! Congrats! Oh my word. Could they be any cuter? Nope. Not one tiny bit. Aw little Bentley is so so cute! Have fantastic weekend with your new little ninja! My heart is melting. And I love the name. Oh my gosh... too adorable for words! I am craaaazy about Bentley! He's sook adorable! I miss having pups at home. My dogs have gotten so big and rough it gets kinda hard to cuddle with them. They're at that stage when they just can't stay still. 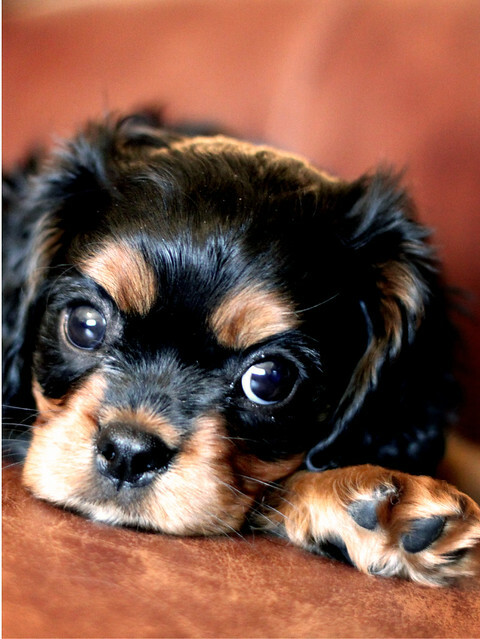 Please share more cute puppy photos! A-DORABLE! They are so cute! Congrats on the new addition! The puppy is terrific! Love it! what a dollbaby! so presh! Oh.my.goodness so cute! Those eyes!! You just want to kiss him and squeeze him all the time I bet!! Can you tell I am a new puppy owner as well? Mine is giving me those eyes right now so I'm going to go cuddle. Happy puppy cuddling! this just made me want one of those dogs (not those two exactly, but that breed!).. gah! how cute are they?!?! So adorable! I'm guessing you had a fabulous weekend! I'm sure you'll guys have so much fun!!! Gah, those faces! So precious! Oh my God, so adorable!!! And I love the name you have chosen! and much cuter than that Bachelorette skeezeball! You've just blinded me with cuteness! And Bentley is such a cute name too! He looks like a Bentley. Oh well, isn't he the cutest little thing I have ever laid my eyes on! Ha ha ha - I love that you had to qualify the name. I LOVE that name, so I'm glad you chose it. Sad that Bentley from the Bachelorette had to put a damper on it. I'm so happy for you! Darling little puppy. OMG isn't that the cutest little fella you've ever seen? !!!! Oh my goodness; so adorable! OHH gosh. My heart = melted. That sweet, sweet, sweet baby!!! shut.the.front.door. cutest thing I've EVER seen. OMG!!! how cute is he!! You're going to have so much fun with him!! Well, you just swamped me with your cuteness. Can I borrow you for just a week?